Many popcorn enthusiasts that consume copious amounts of the tasty snack have moved up from their common stovetop, hot air or microwave popcorn popper to a popcorn machine. 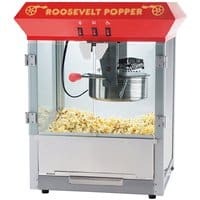 Moreover, most believe the smaller poppers just don't have the true flavor that a good, old fashioned popcorn machine can provide. Nothing tastes better than hot, fresh popcorn right out of the machine. Every popcorn machine has a kettle equipped with some type of stirring rod. The heating element is located in the bottom of this kettle.The popcorn kernels and oil are put in the kettle and then the popping cycle is begun. The heating element is energized and the stirring rod begins the rotate around the bottom of the kettle. The stirring rod keeps all the kernels coated with oil and the popped flakes from sticking to the bottom of the kettle and burning. Once the popping slows down the heating element and stirring rod are turned off and the popped corn is dumped out of the kettle unto the bottom of the popcorn machine. This completes the popping cycle, which normally takes 3 to 4 minutes. Popcorn machines are sized by "kettle" size. 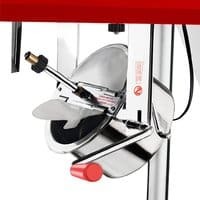 The popcorn machine kettle size refers to the approximate number of one-ounce popped popcorn servings the kettle will produce in one popping cycle. Most machines for home use have kettles between 4 and 8 ounces. So the smallest of these would pop about 4 oz of popped popcorn per cycle. This is equivalent to 4 very small (1 oz) servings, or about 3 1/2 cups per serving. All but the budget model popcorn machines have a heated corn deck. There is a low power heating element that is below the deck where the popcorn lays. This helps to keep the popcorn dry, warm and crisp. Without this feature the popcorn would become cold and chewy. Normally the deck has a grid of holes in it which allows any unpopped kernels to fall through and into a removable drawer. That way the popcorn which is served doesn't have any potential "teeth breakers" in it! The area of the popcorn machine that will be in contact with the popcorn is called the "food zone" and it's typically made of stainless steel. This makes it relatively easy to keep the popper clean. Most machines have some type of light illuminating the popcorn. Sometimes this is a heat lamp to assist in keeping the popped popcorn warm. 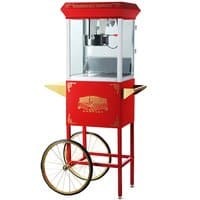 Many of the popcorn machines have an optional cart or base which is made for the machine and matches the look of the popper. Some even have wheels so you can move the popcorn machine to a location where it's needed. These accessories place the popper at the ideal height and add to the visual appeal of the unit. ©Primolicious LLC. 2019 All Rights Reserved for How to Make Popcorn.